Capitán de Navío Juan Francisco de la Bodega y Quadra, circa 1785. Starting in the mid-18th century, Spain's rights began to be challenged by British and Russian fur traders and colonizers. King Charles III of Spain and his successors sent a number of expeditions from New Spain to present-day Canada and Alaska between 1774 and 1793, to counter this threat and to defend Spanish territorial rights. During this period in history, a nation's claims or rights to a certain territory were legitimized by exploration and "prior to Spanish discovery". The first voyage was that of Juan José Pérez Hernández of the frigate Santiago (alias Nueva Galicia). Although intending to reach Alaska, the expedition turned back at Haida Gwaii. Pérez and his crew of 86 were the first known Europeans to visit the Pacific Northwest. In 1775 a second voyage of ninety men led by Lieutenant Bruno de Heceta aboard the Santiago, set sail from San Blas, Nayarit on March 16, 1775 with orders to make clear Spanish claims for the entire Northwestern Pacific Coast. Accompanying Heceta was the schooner Sonora, alias Felicidad, (also known as the Nuestra Señora de Guadalupe), initially under the command of Juan Manuel de Ayala. The 36-foot (11 m) long Sonora and its crew complement of 16 were to perform coastal reconnaissance and mapping, and could make landfall in places the larger Santiago was unable to approach on its previous voyage; in this way, the expedition could officially reassert Spanish claims to the lands north of New Spain it visited. 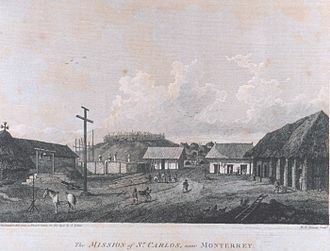 Ayala took command of the packet boat San Carlos, alias Toysón de Oro, also sailing with the expedition, after its initial commander, Miguel Manrique, took ill soon after leaving San Blas. Heceta then gave Bodega y Quadra command of the Sonora. Francisco Antonio Mourelle served as Bodega y Quadra's pilot and the two forged a strong and enduring friendship. The three vessels sailed together as far as Monterey Bay in Alta California. Ayala's mission was to explore the Golden Gate strait while Heceta and Bodega y Quadra continued north. Ayala and the crew of the San Carlos became the first Europeans known to enter San Francisco Bay. The Santiago and Sonora continued sailing north together as far as Point Grenville, named Punta de los Martires (or "Point of the Martyrs") by Heceta in response to an attack by the local Quinault Indians. The vessels parted company on the evening of July 29, 1775. Scurvy had so weakened the crew of the Santiago that Heceta decided to return to San Blas. On the way south he discovered the mouth of the Columbia River between present day Oregon and Washington. Juan Pérez, who was serving as Heceta's pilot, died during the voyage south. Bodega y Quadra, in the Sonora, moved up the coast according to the expedition's orders, ultimately reaching the latitude 59° north on August 15, and entering Sitka Sound near the present-day town of Sitka, Alaska. During the return voyage south Bodega y Quadra discovered, named, and explored a portion of Bucareli Bay on the west side of Prince of Wales Island. During Bodega y Quadra's voyage numerous "acts of sovereignty" were performed. Many place names were given, including Puerto de Bucareli (Bucareli Bay), Puerto de los Remedios, and Mount San Jacinto, renamed Mount Edgecumbe by British explorer James Cook three years later. 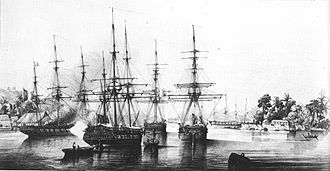 A third voyage took place in 1779 under the command of Ignacio de Arteaga with two armed corvettes: the Favorita under Arteaga, and the Princesa under Bodega y Quadra. With Arteaga on the Favorita was second officer Fernando Quiros y Miranda, surgeon Juan Garcia, pilot Jose Camacho, and second pilot Juan Pantoja y Arriaga. With Bodega y Quadra on the Princesa was second officer Francisco Antonio Mourelle, surgeon Mariano Nunez Esquivel, pilot Jose Canizares, and second pilot Juan Bautista Aguirre. The expedition's objective was to evaluate the Russian penetration of Alaska, search for a Northwest Passage, and capture James Cook if they found him in Spanish waters. Spain had learned about Cook's 1778 explorations along the coast of the Pacific Northwest. In June 1779, during the expedition of Arteaga and Bodega y Quadra, Spain entered the American Revolutionary War as an ally of France, precipitating a parallel Anglo-Spanish War, which continued until the 1783 Treaty of Paris. Arteaga and Bodega y Quadra did not find Cook, who had been killed in Hawaii in February 1779. During the voyage Arteaga and Bodega y Quadra carefully surveyed Bucareli Bay then headed north to Port Etches on Hinchinbrook Island. They entered Prince William Sound and reached a latitude of 61°, the most northern point obtained by the Spanish explorations of Alaska. They also explored Cook Inlet, and the Kenai Peninsula, where a possession ceremony was performed on August 2, in what today is called Port Chatham. Due to various sicknesses among the crew Arteaga returned to California without finding the Russians. Throughout the voyage, the crews of both vessels endured many hardships, including food shortages and scurvy. On September 8, the ships rejoined and headed south for the return trip to San Blas. Although the Spanish were normally secretive about their exploring voyages and the discoveries made, the 1779 voyage of Arteaga and Bodega y Quadra became widely known. La Perouse obtained a copy of their map, which was published in 1798. Mourelle's journal was acquired and published in London in 1798 by Daines Barrington. After these three exploration voyages to Alaska within five years there were no further Spanish expeditions to the Pacific Northwest until 1788, after the Treaty of Paris ended the war between Spain and Britain. During the war Spain dedicated the port of San Blas to the war effort in the Philippines. Voyages of exploration were suspended. Support of Alta California, which depended upon San Blas, was minimal. By 1786 Alta California had become nearly self-supporting and peace with Britain was restored, making further voyages to Alaska possible. In March, 1788, two ships were sent north from San Blas to investigate Russian activity. Esteban José Martínez, on the Princesa, was in command of the expedition, accompanied by the San Carlos under Gonzalo López de Haro, with José María Narváez serving as Haro's pilot. The ships arrived at Prince William Sound in May. Following evidence of Russian fur trading activity the ships sailed west. In June Haro reached Kodiak Island and learned from the natives that a Russian post was nearby. On June 30, 1788, Haro sent Narváez in a longboat to look for the Russian post at Three Saints Bay. Narváez found the post, becoming the first Spaniard to make contact with a large contingent of Russians in Alaska. Narváez took the Russian commander, Evstrat Delarov to meet Haro on the San Carlos, then returned him to his outpost. Delarov gave Narváez a Russian map of the Alaskan coast and indicated the locations of seven Russian posts containing nearly 500 men. Delarov also told Narváez that the Russians intended to occupy Nootka Sound, on the west coast of Vancouver Island. After this meeting Haro sailed east and joined Martínez at Sitkinak Island. Using the information acquired from Delarov, the expedition sailed to Unalaska Island, where there was a large Russian post, also called Unalaska, under the command of Potap Kuzmich Zaikov. Martínez arrived on July 29, Haro on August 4. Zaikov gave Martínez three maps covering the Aleutian Islands. He also confirmed that the Russians planned to take possession of Nootka Sound the next year. Zaikov explained that two Russian frigates were already on their way, and a third which was to sail to Nootka Sound. He was referring to the 1789 expedition of Joseph Billings, but greatly exaggerating its mission. The visit to Unalaska marks the westernmost point reached during the Spanish voyages of exploration in Alaska. The Spanish expedition left Unalaska on August 18, 1788, heading south for California and Mexico. Due to increasing conflict between Martínez and Haro, the ships broke off contact within three days sailed south separately. Martínez had allowed this but ordered Haro to rejoin him at Monterey, California. But during the voyage south Haro, with support from Narváez and the other pilots, declared his ship no longer under Martínez's command. They sailed back to San Blas on their own, arriving on October 22, 1788. Martínez spent a month in Monterey waiting for Haro. He arrived at San Blas in December, where he found himself faced with charges of irresponsible leadership. He soon regained favor and was placed in charge of a new expedition to occupy Nootka Sound before the Russians did. This expedition took place in 1789, culminating in the Nootka Crisis. Following up on the 1788 voyage to Alaska, Martínez and Haro were ordered to preemptively take possession of Nootka Sound before the Russians or British could. Events at Nootka Sound in 1789 led to the Nootka Crisis. During the summer of 1789 Martínez sent José María Narváez to explore the Strait of Juan de Fuca in the Santa Gertrudis la Magna (formerly the Northwest America, a British vessel captured earlier by Martínez at Nootka Sound). Narváez found the Strait of Juan de Fuca to be a large inlet with much promise for further exploration. By the end of the year Martínez abandoned Nootka Sound. The Nootka Crisis became a major international incident nearly leading to war between Spain and Britain. As the process unfolded, the Viceroy of New Spain decided it was important to establish a permanent base at Nootka Sound. Three ships sailed to Nootka Sound, with Francisco de Eliza as the overall commander and captain of the Concepción. Manuel Quimper captained the Princesa Real (the Spanish name for the British vessel Princess Royal, captured by Martínez in 1789). Salvador Fidalgo captained the San Carlos. The first settlement in present-day British Columbia was built on Nootka Sound, Santa Cruz de Nuca as well as Fort San Miguel, manned by soldiers of the First Company of Free Company of Volunteers of Catalonia, under Pedro de Alberni. After getting settled, Eliza dispatched Fidalgo and Quimper on exploration voyages. Fidalgo was sent north and Quimper south. In 1790, Spanish explorer Salvador Fidalgo took the San Carlos to Alaska, visiting and naming Cordova Bay and Port Valdez in Prince William Sound. Acts of sovereignty were performed at both places. Fidalgo entered Cook Inlet and found the Russian post Pavlovskaia, the Pavel Lebedev-Lastochkin Company post at the mouth of the Kenai River. Fidalgo did not stop at the post but continued west to Kodiak Island, where he noted Shelikov's post. Fidalgo then went to the Russian settlement at Alexandrovsk (today's English Bay or Nanwalek, Alaska), southwest of today's Anchorage on the Kenai Peninsula, where again, Fidalgo asserted the Spanish claim to the area by conducting a formal ceremony of sovereignty. In 1790 Manuel Quimper, with officers López de Haro and Juan Carrasco, sailed the Princesa Real into the Strait of Juan de Fuca, following up on voyage of Narváez the previous year. Quimper sailed to the eastern end of the Strait of Juan de Fuca, discovering the San Juan Islands and many straits and inlets. Having limited time he had to return to Nootka without fully exploring the promising straits and inlets. Contrary winds made it impossible to sail the small vessel to Nootka, so Quimper went south to San Blas instead. In 1791 Francisco de Eliza was ordered to continue the exploration of the Strait of Juan de Fuca. The voyage consisted of two vessels. Eliza sailed on the San Carlos, with Pantoja as his pilot (master). Narváez sailed on the Santa Saturnina, with Carrasco and Verdía as pilots. During the voyage the Strait of Georgia was discovered, and Narváez conducted a quick exploration of most of it. Eliza sailed the San Carlos back to Nootka Sound, but the Santa Saturnina, under Carrasco, failed to reach Nootka and instead sailed south to Monterey and San Blas. In Monterey Carrasco met Alessandro Malaspina and told him about the discovery of the Strait of Georgia. This meeting led directly to the 1792 voyage of Galiano and Valdés. The King of Spain gave Alejandro Malaspina and José de Bustamante y Guerra command of an around-the-world scientific expedition with two corvettes, the Descubierta and Atrevida. One of the king's orders was to investigate a possible Northwest Passage. The expedition was also to search for gold, precious stones, and any American, British, or Russian settlements along the northwest coast. 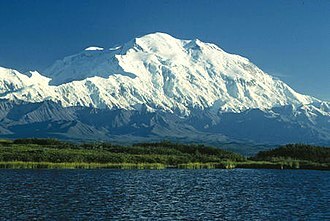 Arriving in Alaska in 1791, Malaspina and Bustamante surveyed the coast to the Prince William Sound. At Yakutat Bay, the expedition made contact with the Tlingit. 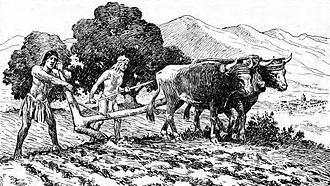 Spanish scholars made a study of the tribe, recording information on social mores, language, economy, warfare methods, and burial practices. Artists with the expedition, Tomas de Suria and José Cardero, produced portraits of tribal members and scenes of Tlingit daily life. Malaspina Glacier, between Yakutat Bay and Icy Bay was subsequently named after Alessandro Malaspina. In 1792 Dionisio Alcalá Galiano, on the Sutil, and Cayetano Valdés y Flores, on the Mexicana, sailed from San Blas to Nootka Sound, then circumnavigated Vancouver Island. An account of the voyage of Galiano and Valdés, in contrast, was published in Spain and widely promoted, overshadowing the more significant voyage of Malaspina, who had become a political prisoner shortly after returning to Spain. Jacinto Caamaño, commander of the frigate Aránzazu, sailed to Bucareli Bay in 1792. Juan Pantoja y Arriaga served as his pilot. Caamaño conducted a detailed survey of the coast south to Nootka Sound on Vancouver Island. By 1792 much of the coast had already been visited by European explorers, but some areas had been overlooked, such as the southern part of Prince of Wales Island. A number of Caamaño's place names in the area have survived, such as Cordova Bay, Revillagigedo Channel, Bocas de Quadra, and in what is now called Caamaño Passage, Zayas Island (named for his second pilot, Juan Zayas). No report on Caamaño's voyage was published until long after and his discoveries remained obscure, although George Vancouver apparently met Caamaño and obtained copies of his maps, especially of areas north of Dixon Entrance. Vancouver later incorporated some of Caamaño's place names into his atlas. In 1793 Francisco de Eliza and Juan Martínez y Zayas surveyed the coast between the Strait of Juan de Fuca and the San Francisco Bay. They also explored the mouth of the Columbia River. In the end Spain withdrew from the North Pacific and transferred its claims in the region to the United States in the Adams-Onís Treaty of 1819. Today, Spain's legacy in Alaska and the Pacific Northwest endures as a number of place names, such as Malaspina Glacier, Revillagigedo Island, the towns of Valdez and Cordova, and numerous smaller features. ^ a b c Geographical Society of the Pacific (1907). Transactions and Proceedings of the Geographical Society of the Pacific, Volume 4. San Francisco. pp. 108, 152. 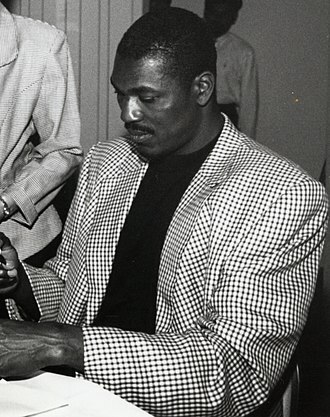 OCLC 15737543. ^ a b Rodríguez Sala, María Luisa (2006). De San Blas Hasta la Alta California: Los Viajes y Diarios de Juan Joseph Pérez Hernández (in Spanish). Universidad Autónoma de México. p. 35. ISBN 978-970-32-3474-5. ^ Pethick, Derek (1976). First Approaches to the Northwest Coast. Vancouver: J.J. Douglas. p. 43. ISBN 0-88894-056-4. ^ a b c "The Spanish Navy in the Californias during the Revolutionary War Era". The California State Military Museum. Retrieved 6 December 2009. ^ a b c McDowell, Jim (1998). José Narváez: The Forgotten Explorer. Spokane, Washington: The Arthur H. Clark Company. pp. 24–31. ISBN 0-87062-265-X. 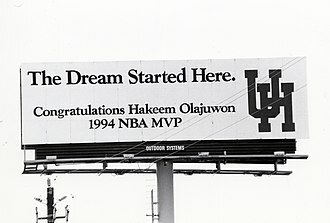 ^ Haycox, Stephen W. (2002). Alaska: an American Colony. University of Washington Press. p. 175. ISBN 978-0-295-98249-6. ^ Haycox, Stephen W. (2002). Alaska: an American Colony. University of Washington Press. p. 170. ISBN 978-0-295-98249-6. ^ "Spanish Place Names on the Face of Alaska". ExploreNorth. Retrieved 5 December 2009. ^ "Spanish explorers". Archived from the original on February 9, 2010. ^ Tovell, Freeman M. (2008). At the Far Reaches of Empire: The Life of Juan Francisco De La Bodega Y Quadra. University of British Columbia Press. p. 154. ISBN 978-0-7748-1367-9. Arteaga Voyage records. 1779. 1 document. At the University of Washington Libraries, Special Collections. De la Cosa played an important role in the first and second voyage of Christopher Columbus to the West Indies, since he was the owner and captain of the Santa María. In 1499, he served as the pilot in the expedition of Alonso de Ojeda to the coasts of South America. Upon his return to Andalusia, he drew his famous mappa mundi and soon returned to the Indies, in 1509, he began what would be his last expedition, again with Ojeda, to take possession of the coasts of modern Colombia. De la Cosa died in an confrontation with indigenous people before he could get possession of Urabá. Some 16th-century chroniclers called him the Biscayan, leading to confusion with another sailor called Juan Vizcaino, today they are known to be different people. His date of birth is unknown, but it is estimated between 1450 and 1460, nor is any information available from his childhood or adolescence. It is assumed that the man took part in sailing voyages around the Bay of Biscay and towards the Canary Islands. The first solid references come from 1488, when Juan de la Cosa was in Portugal, at that time, navigator Bartolomeu Dias had just arrived in Lisbon, after having reached the Cape of Good Hope. The Catholic Monarchs may have sent de la Cosa to that city as a spy to obtain information and he managed to return to Castile before Portuguese officers captured him. Early in the 1490s, Juan de la Cosa was living in El Puerto de Santa María and it is believed that it was there that he established a business relationship with the Pinzón brothers. According to some historians he was born in 1460 at Sta, maria del Puerto, in Cantabria, Spain. From early childhood he spent time on the water, from the waters of his native country, which he knew thoroughly, he soon ventured on to the coast of Western Africa, which was at that time the goal of many Spanish expeditions. The first reliable references place him in Portugal in 1488, meeting the explorer Bartolomeu Dias who had just sailed around the Cape of Good Hope, Juan de la Cosa sailed with Christopher Columbus on his first three voyages to the New World. He owned and was master of the Santa María, flagship of Columbuss first voyage in 1492, the vessel shipwrecked that year on the night of 24–25 December off the present-day site of Cap-Haïtien, Haiti. British colonization of the Americas began in 1607 in Jamestown and reached its peak when colonies had been established throughout the Americas. The British were among the most important colonizers of the Americas, three types of colonies existed in the British Empire in America during the height of its power in the 18th Century. These were charter colonies, proprietary colonies and royal colonies, a group of 13 British American colonies collectively broke from the British Empire in the 1770s through a successful revolution, establishing the modern United States. After the end of the Napoleonic Wars, British territories in the Americas were slowly granted more responsible government, in 1838 the Durham Report recommended full responsible government for Canada, but this was not fully implemented for another decade. Eventually, with the Confederation of Canada, the Canadian colonies were granted significant autonomy, other colonies in the Americas followed at a much slower pace. In this way, two countries in North America, ten in the Caribbean, and one in South America have received their independence from the United Kingdom, all of these are members of the Commonwealth of Nations and nine are Commonwealth realms. The eight current British overseas territories in the Americas have varying degrees of self-government, a number of English colonies were established under a system of Proprietary Governors, who were appointed under mercantile charters to English joint stock companies to found and run settlements. In 1607, Virginia was founded by the London Company, in Newfoundland, a chartered company known as the Society of Merchant Venturers established a permanent settlement at Cupers Cove, from 1610. St. Georges, Bermuda was founded by the Virginia Company, in 1664, England took over the Dutch colony of New Netherland which England renamed the Province of New York. With New Netherland, the English came to control the former New Sweden and this became part of Pennsylvania after that was established in 1680. 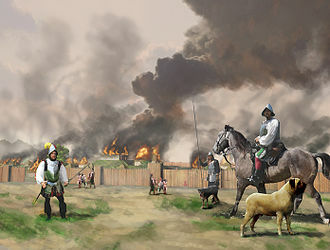 The Kingdom of Scotland tried unsuccessfully to establish a colony at Darién, thousands of Scotsmen participated in English colonization before the two countries were united in 1707. 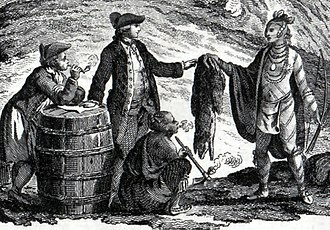 The Kingdom of Great Britain acquired the French colony of Acadia in 1713 and Canada, in the north, the Hudsons Bay Company actively traded for fur with the indigenous peoples, and had competed with French and Metis fur traders. Colloquially referred to as the New World, this second super continent came to be termed Americas, deriving its name from Americus, the Latin version of Vespuccis first name. 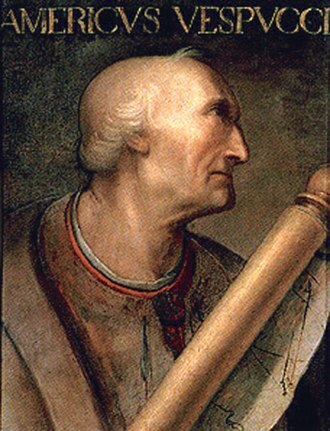 Amerigo Vespucci was born and raised in Florence on the Italian Peninsula and he was the third son of Ser Nastagio Vespucci, a Florentine notary, and Lisabetta Mini. The father of Ser Nastagio Vespucci had the name Amerigo Vespucci also, Amerigo Vespucci was educated by his uncle, Fra Giorgio Antonio Vespucci, a Dominican friar of the monastery of San Marco in Florence. 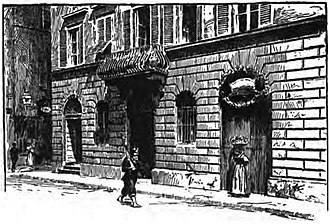 Vespucci acquired the favor and protection of Lorenzo di Pierfrancesco de Medici who became the head of the business after the elder Lorenzos death in 1492, just around this time, Vespucci was engaged as the executor of Giannotto Berardi, an Italian merchant who had recently died in Seville. Vespucci organized the fulfillment of Berardis outstanding contract with the Castilian crown to provide twelve vessels for the Indies, after these were delivered, Vespucci continued as a provision contractor for Indies expeditions, and is known to have secured beef supplies for at least one of Columbus voyages. At the invitation of king Manuel I of Portugal, Vespucci participated as observer in several voyages that explored the east coast of South America between 1499 and 1502. On the first of these voyages he was aboard the ship that discovered that South America extended much further south than previously thought, the expeditions became widely known in Europe after two accounts attributed to Vespucci were published between 1502 and 1504. In 1507, Martin Waldseemüller produced a map on which he named the new continent America after the feminine Latin version of Vespuccis first name. In an accompanying book, Waldseemüller published one of the Vespucci accounts, in 1508, the position of chief of navigation of Spain was created for Vespucci, with the responsibility of planning navigation for voyages to the Indies. Two letters attributed to Vespucci were published during his lifetime, mundus Novus was a Latin translation of a lost Italian letter sent from Lisbon to Lorenzo di Pierfrancesco de Medici. It describes a voyage to South America in 1501–1502, mundus Novus was published in late 1502 or early 1503 and soon reprinted and distributed in numerous European countries. Lettera di Amerigo Vespucci delle isole nuovamente trovate in quattro suoi viaggi, printed in 1504 or 1505, it claimed to be an account of four voyages to the Americas made by Vespucci between 1497 and 1504. A Latin translation was published by the German Martin Waldseemüller in 1507 in Cosmographiae Introductio, Vespucci even developed a rudimentary, but fairly accurate method of determining longitude. In the 18th century, three unpublished familiar letters from Vespucci to Lorenzo de Medici were rediscovered, one describes a voyage made in 1499–1500 which corresponds with the second of the four voyages. Another was written from Cape Verde in 1501 in the part of the third of the four voyages. The third letter was sent from Lisbon after the completion of that voyage, some have suggested that Vespucci, in the two letters published in his lifetime, was exaggerating his role and constructed deliberate fabrications. The Colonial expansion under the crown of Castile was initiated by the Spanish conquistadores and developed by its administrators and missionaries. 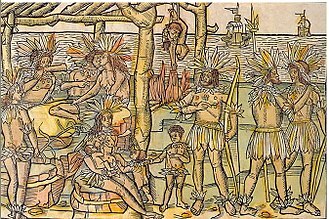 The motivations for colonial expansion were trade and the spread of the Catholic faith through indigenous conversions and it is estimated that during the colonial period, a total of 18.6 million Spaniards settled in the Americas and a further 3.5 million immigrated during the post-colonial era. Spains loss of these last territories politically ended the Spanish rule in the Americas, the Catholic Monarchs Isabella of Castile, Queen of Castile and her husband King Ferdinand, King of Aragon, pursued a policy of joint rule of their kingdoms and created a single Spanish monarchy. Even though Castile and Aragon were ruled jointly by their respective monarchs, the Catholic Monarchs gave official approval for the plans of Genoese mariner Christopher Columbus for a voyage to reach India by sailing West. The funding came from the queen of Castile, so the profits from Spanish expedition flowed to Castile, in the extension of Spanish sovereignty to its overseas territories, authority for expeditions of discovery and settlement resided in the monarchy. Columbus made four voyages to the West Indiesas the monarchs granted Columbus the governorship of the new territories and he founded La Navidad on the island named Hispaniola, in what is present day Haiti on his first voyage. After its destruction by the indigenous Taino people, the town of Isabella was begun in 1493, in 1496 his brother, founded Santo Domingo. By 1500, despite a death rate, there were between 300 and 1000 Spanish settled in the area. 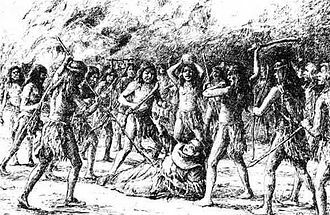 The local Taíno people continued to resist, refusing to plant crops, the first mainland explorations were followed by a phase of inland expeditions and conquest. In 1500 the city of Nueva Cádiz was founded on the island of Cubagua, the Spanish founded San Sebastian de Uraba in 1509 but abandoned it within the year. There is indirect evidence that the first permanent Spanish mainland settlement established in the Americas was Santa María la Antigua del Darién, the Spanish conquest of Mexico is generally understood to be the Spanish conquest of the Aztec Empire which was the base for conquests of other regions. Later conquests were protracted campaigns with less spectacular results than conquest of the Aztecs, but not until the Spanish conquest of Peru was the conquest of the Aztecs matched in scope by the victory over the Inca empire in 1532. 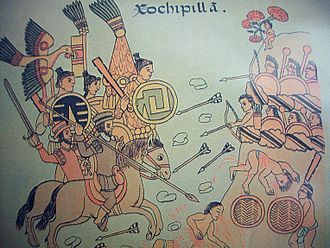 The Spanish conquest of the Aztec empire was led by Hernán Cortés, the victory over the Aztecs was relatively quick, from 1519 to 1521, and aided by his Tlaxcala and other allies from indigenous city-states or altepetl. These polities allied against the Aztec empire, to which they paid tribute following conquest or threat of conquest, leaving the political hierarchy. The Spanish conquest of Yucatán was a longer campaign, from 1551 to 1697, against the Maya peoples in the Yucatán Peninsula of present-day Mexico. When Hernán Cortés landed ashore at present day Veracruz and founded the Spanish city there on April 22,1519, Spain colonized and exerted control of Alta California through the Spanish missions in California until the Mexican secularization act of 1833. 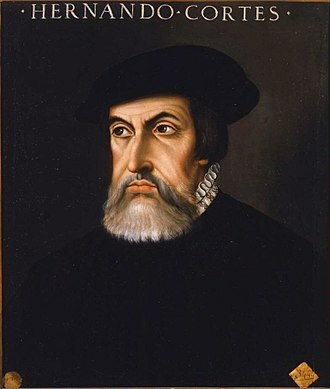 Pedro Gutiérrez de Valdivia or Valdiva was a Spanish conquistador and the first royal governor of Chile. 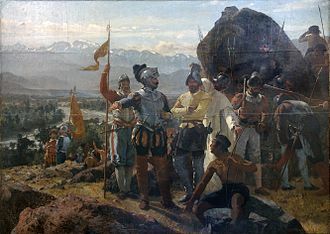 After serving with the Spanish army in Italy and Flanders, he was sent to South America in 1534, in 1540 he led an expedition of 150 Spaniards into Chile, where he defeated a large force of Indians and founded Santiago in 1541. 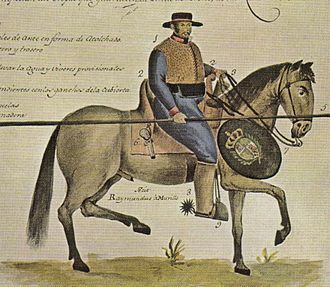 He extended Spanish rule south to the Bío-Bío River in 1546, fought again in Peru and he began to conquer Chile south of the Bío-Bío and founded Concepción in 1550. He was captured and killed in a campaign against the Araucanian Indians, the city of Valdivia in Chile is named after him. 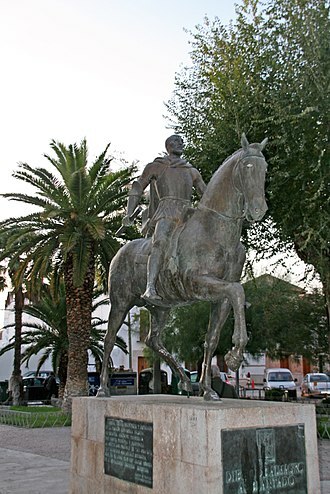 Pedro de Valdivia is believed to have born in Villanueva de la Serena in Extremadura. In 1520 he joined the Spanish army of Charles I and fought in Flanders in 1521 and he reached America in 1535, spent an uneventful year in Venezuela, and moved on to Peru in 1537. There he took part on the side of Hernando Pizarro in his struggle against Diego de Almagro and fought in the battle of Las Salinas in 1538, afterwards he accompanied Hernando and Gonzalo Pizarro to conquer both the province of Collao and las Charcas in High Peru. As compensation for his help in conquering these lands, he was awarded a silver mine, Valdivia had married Marina Ortíz de Gaete in Spain, but in Peru he became attached to the widow Inés de Suárez, who was to accompany him to Chile as his mistress. 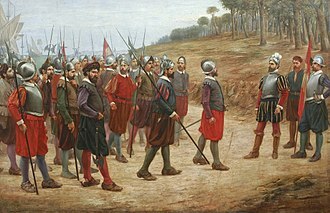 After the failure of the expedition of Diego de Almagro in 1536, Valdivia asked governor Francisco Pizarro for permission to complete the conquest of that territory. He got his permission but was appointed only Lieutenant Governor, the expedition was fraught with problems from the beginning. Valdivia had to sell the lands and the mine that had been assigned to him in order to finance the expedition, a shortage of soldiers and adventurers was problematic since they were not interested in conquering what they were sure were extremely poor lands. Furthermore, while he was preparing the expedition, Pedro Sancho de Hoz arrived from Spain with a grant for the same country. 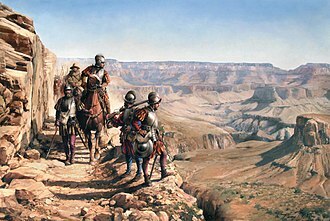 To avoid difficulties, Pizarro advised the two competitors to join their interests, and on December 28,1539, a contract of partnership was signed, the small expedition finally left Cuzco, Peru in January,1540, with Pizarros permission and Pedro Sancho de Hoz as partner. 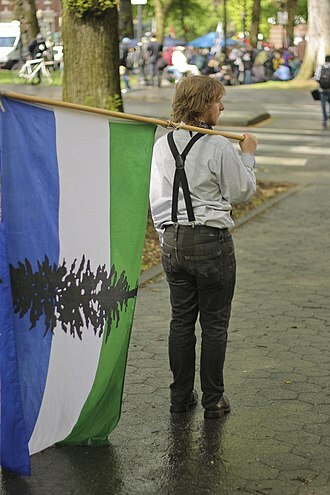 The Pacific Northwest, sometimes referred to as Cascadia, is a geographic region in western North America bounded by the Pacific Ocean to the west and loosely, by the Rocky Mountains on the east. Though no agreed boundary exists, a common conception includes the U. S. states of Oregon and Washington and the Canadian province of British Columbia. Broader conceptions reach north into Alaska and Yukon, south into far northern California and east to the Continental Divide, thus including Idaho, Western Montana, narrower conceptions may be limited to the northwestern US or to the coastal areas west of the Cascade and Coast mountains. The variety of definitions can be attributed to partially overlapping commonalities of the history, society. 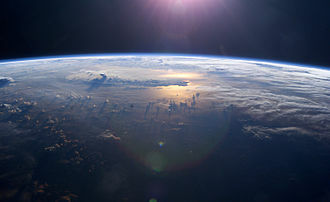 The Northwest Coast is the region of the Pacific Northwest. 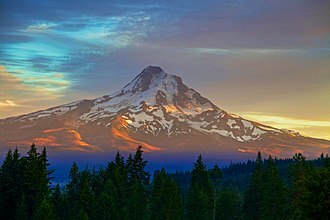 The term Pacific Northwest should not be confused with the Northwest Territory or the Northwest Territories of Canada. The border — in two sections, along the 49th parallel south of British Columbia and the Alaska Panhandle west of northern British Columbia — has had an effect on the region. According to Canadian historian Ken Coates, the border has not merely influenced the Pacific Northwest—rather, definitions of the Pacific Northwest region vary, and there is no commonly agreed-upon boundary, even among Pacific Northwesterners. A common conception of the Pacific Northwest includes the U. S. states of Oregon and Washington as well as the Canadian province of British Columbia. Broader definitions of the region may include the U. S. state of Alaska, the Canadian territory of Yukon, the portion of the state of California. Definitions based on the historic Oregon Country reach east to the Continental Divide, thus including all of Idaho and parts of western Montana. 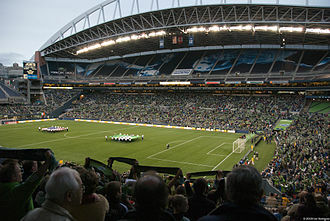 Sometimes the Pacific Northwest is defined as being the Northwestern United States, often these definitions are made by government agencies whose scope is limited to the United States. Some definitions include, in addition to Washington, Oregon and British Columbia, Southeast Alaska, western Montana, the coast of northern California, the Pacific Northwest has been occupied by a diverse array of indigenous peoples for millennia. The Spanish conquest of the Inca Empire was one of the most important campaigns in the Spanish colonization of the Americas. It was the first step in a campaign that took decades of fighting but ended in Spanish victory in 1572. The conquest of the Inca Empire led to spin-off campaigns into present-day Chile and Colombia, when the Spanish arrived at the borders of the Inca Empire in 1528, it spanned a considerable area, by far the largest of the four grand pre-Columbian civilizations. In less than a century, the Inca had expanded their empire from about 400,000 km² in 1448, to 1,800,000 km² in 1528 and this vast area of land varied greatly in cultures and in climate. Because of the cultures and geography, the Inca allowed many areas of the empire to be governed under the control of local leaders. However, under the administrative mechanisms established by the Inca, all parts of the empire answered to, and were ultimately under the control of. Scholars estimate that the population of the Inca Empire numbered more than 16,000,000, in 1528, Emperor Huayna Capac ruled the Inca Empire. He could trace his lineage back to a king named Manco Cápac, the mythical founder of the Inca clan. On his accession to the throne, Huayna Capac had continued the policy of expansion by conquest, while he had to put down a number of rebellions during his reign, by the time of his death, his legitimacy was as unquestioned as was the primacy of Inca power. However, expansion had resulted in its own problems, many parts of the empire maintained distinctive cultures and these were at best resistive participants in the imperial project. 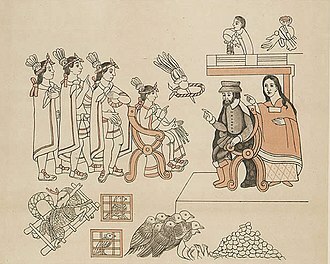 Huayna Capac relied on his sons to support his reign, while he had many legitimate and illegitimate children, two sons are historically important. Prince Túpac Cusi Hualpa, known as Huáscar, was the son of Coya Mama Rahua Occllo of the royal line and these two sons would play pivotal roles in the final years of the Inca Empire. 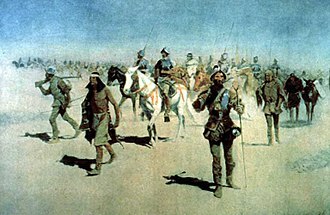 The Spanish conquistador Pizarro and his men were greatly aided in their enterprise by invading when the Inca Empire was in the midst of a war of succession between the princes Huáscar and Atahualpa. Balboa setting his dogs upon Indian practitioners of homosexuality (1594) engraving from the New York Public Library. The rendering was by the Flemish Protestant artist Theodor de Bry. Monument of Vasco Núñez de Balboa in Panama City. Trails taken by Spanish explorers from Mexico into Texas. Missions in Spanish Texas at the beginning of the Spanish colonization in the area. 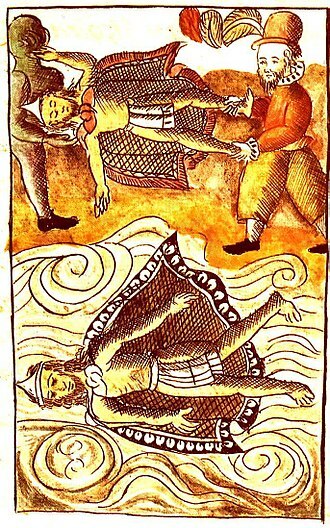 Hernán Cortés followed the Yucatán coast on his way to conquer the Aztecs. 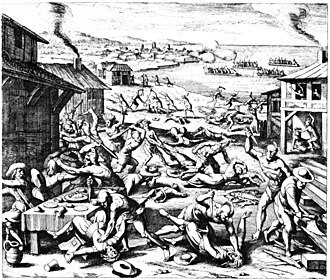 The massacre of Jamestown settlers in 1622. Soon the colonists in the South feared all natives as enemies. 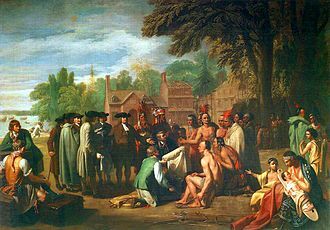 The Treaty of William Penn with the Indians. Penn's Treaty was never violated. Monument dedicated to Juan de la Cosa in Santoña, Cantabria.